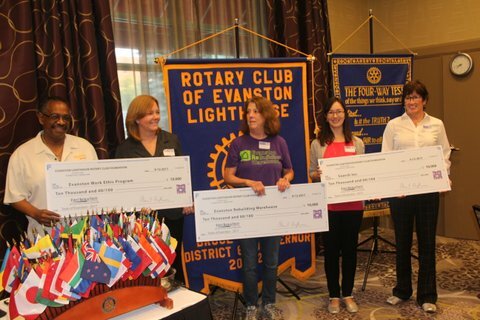 "Evanston Lighthouse Rotary Club presents $10,000 checks to the 2017 Taste of Evanston principal beneficiaries: Evanston We Program, No Boundaries/Search, Inc., and Evanston Rebuilding Warehouse, to support their outstanding and vital work-readiness programs. Photo Credit: John Searles. ELRC is proud to support their work by making our largest donations to date. These grants are a celebration of the dignity of work as an opportunity to serve others. They are a demonstration of Evanston Lighthouse Rotary Club’s commitment to stand with our community's businesses, not-for-profit, and government sectors to promote the highest quality of life for all, with the highest degree of integrity. Thanks to our business sponsors and underwriters for supporting Service Above Self here in the our community and around the world: ZS Associates, Bradley Investment Center, Northwestern University, Terra & Vine, The Barn, Hearth Restaurant, Creperie Saint Germain, Bluestone, Found, Peckish Pig, Koi Fine Asian Cuisine & Lounge, Temperance Beer Co., Sketchbook Brewing Company, Boltwood, Hewn. 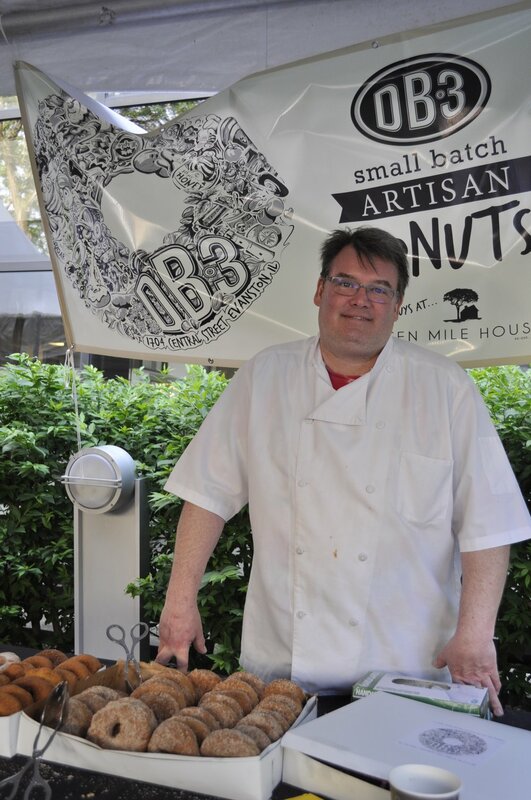 DB3 Donuts, Mount Everest Restaurant, Patisserie Coralie, Cupitol Coffee & Eatery - Evanston, Vinic Wine, Agortles Dessert Shop, The Wine Goddess, YoFresh Evanston, Edzo's Burger Shop Evanston, Hoosier Mama Pie Company, Farmhouse Evanston, Tag's Bakery, Bangers & Lace Evanston, Bat 17, Kabul House Restaurant, NaKorn, Hecky's Barbecue, Jennifer's Edibles, Inc, Lulu's, Table To Stix Ramen, Ruth Rosin, Chicago Northshore Kinetics, MSGroup Chicago at Dream Town Realty, North Shore Dentistry for Children - MaLu Simón, Glader Filmworks - Bill Glader, Evanston Subaru in Skokie, Hagerty Consulting, John J. Cahill, Inc., Porte Browne Certified Public Accountants, NorthShore University HealthSystem, and many more." Wine Tasting with Alpana Singh! Taste of Evanston 2017 kicked off with a wine tasting with Master Sommelier Alpana Singh on May 24th at her stunning new restaurant Terra & Vine. Guests took their palates on a world tour with a tasting from eight leading wine regions and enjoyed light hors d'oeuvres while learning about wines from a global perspective. Taste of Evanston: Take a Bite Out of Hunger targeted two area hunger relief organizations as the principal beneficiaries of it’s fundraising effort: Hillside Food Pantry which provides nutritious meals to 500 food insecure families each week and Hunger Resource Network which connects surplus food from farmers markets and grocery stores to food pantries, soup kitchens, and shelters. 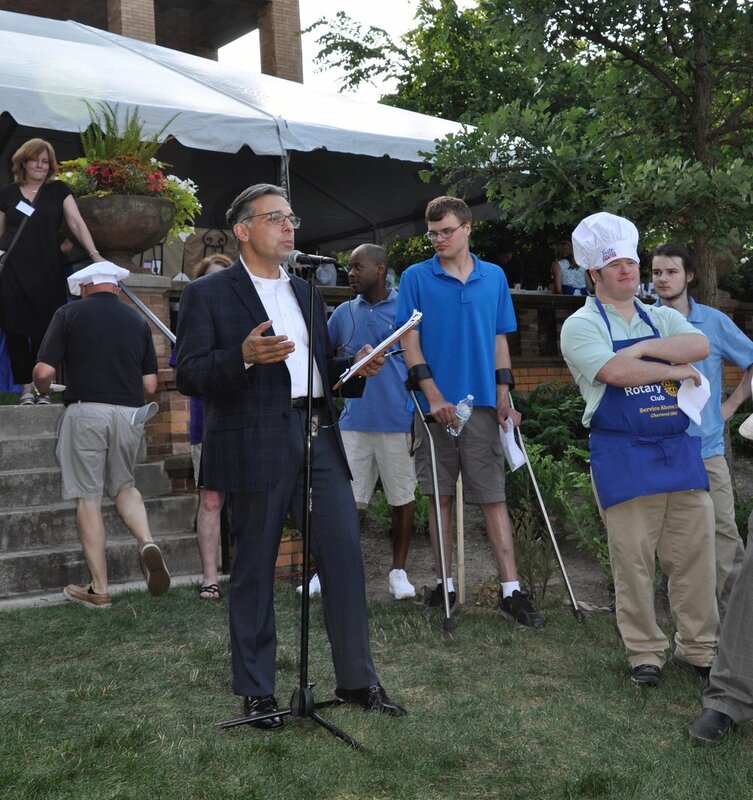 Evanston Lighthouse Rotary Club’s other local and international philanthropic programs were also supported by the event’s proceeds of over $32,000. Held at the garden plaza of Rotary International in Evanston, the fundraiser featured both well known and new Evanston restaurants including Bistro Bordeaux, Bluestone, Creperie Saint Germain, DB3 Donuts, Farmhouse, Foodstuffs, Hearth, Hecky’s Barbeque, Kabul House, Kingston Grill, Koi, LYFE Kitchen, Mount Everest, Olive Mountain, Peckish Pig, Temperance Beer Company, Union Pizza, /Union Squared, Vinic Wine Company and YoFresh Yogurt Café. Guests were entertained by R&B band Suite Mollie and magician A.J. Sacco. 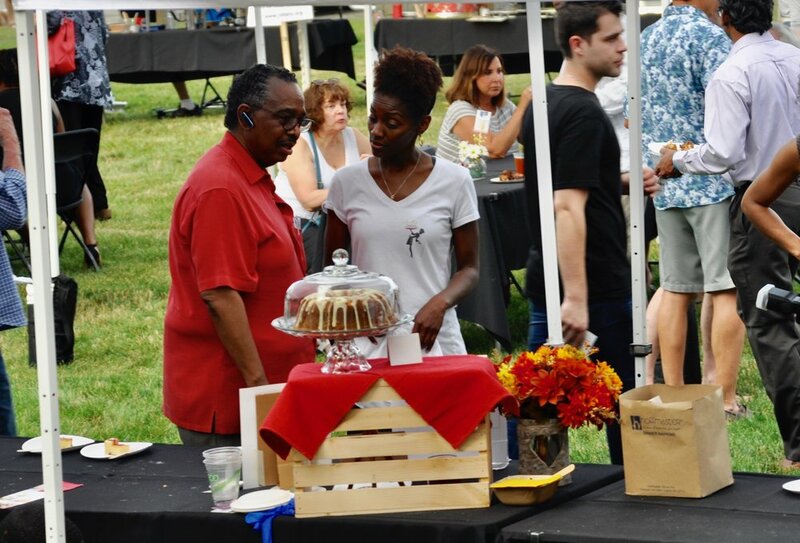 The fundraiser was also a zero waste event, with Evanston’s Collective Resource, Inc. collecting all food scraps as well as biodegradable plates, cups and flatware and transporting them to a commercial composting site. The event was sponsored by Bradley Investment Center, North Shore Dentistry for Children, MS Group Dream Town Realty, Financial Strategy Network, Creative Case Management, Bramer Animal Hospital, Glader Filmworks, First Bank and Trust, Central Rug and Carpet, Hagerty Consulting, Flader Plumbing, Romano Wealth Management, Nels Johnson Tree Experts, Berglund Animal Hospital, Mark Vend, Symphony, Brad Weiss, DDS, Porte Brown, LLC, Bernard Food Industries, Harold Bauer, Peterson Appraisal Group, Ilana Seligman, Kathy Tate-Bradish, Joan Borg, Marisa Naujokas, Ken Green, Yves Lassere, Malu Simón, Elaine Clemens, and Lesley Peters.